This really made me feel good. It looks like what we are doing here at Amped Software is having an impact on society, and more than we expected. I think most people in our community would be surprised by the numbers. At Amped, we see hundreds of cases every year, and for more than half of the images and videos that we receive, we just say that they are useless. I often like to say that what attracts people the most to Amped FIVE are the amazing results of our sample images but what people appreciate most once they start using Amped FIVE on a regular basis, is the seamless and scientific workflow for everyday tasks. Most of the material we get is the classic three-pixels-saturated-compressed-blurred-license-plate, and there’s not much to do there anyways if you just want the license plate. 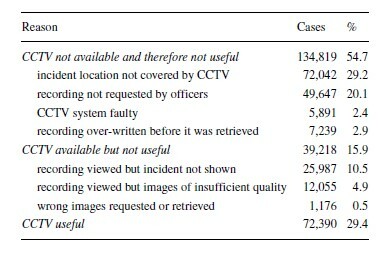 So, we often complain about the quality of CCTV footage, the inexperience of the system installer or the decision of the system owner to buy cheap stuff. 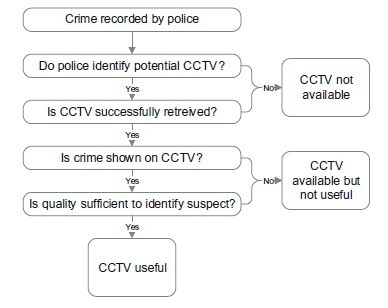 We don’t realize, even in the bad cases, how much information we can actually get from CCTV, even if the quality is terrible. Below are some additional figures from the paper which I think are worth noting. In the first image below, you can see that the quality was not the only issue, but also technical problems like overwriting and a faulty system are a big deal, and many times CCTV was not requested at all. 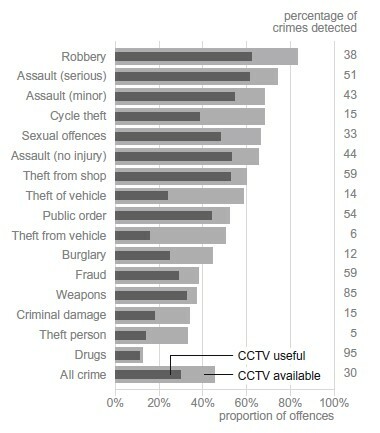 In the next image below, you can see the impact of CCTV on several types of crimes. There’s a long discussion on various types of crimes in the paper so I highly recommend to read it thoroughly. Very often the quality of a video is insufficient for identifying a person or a license plate, but the video can give us other important information: if some event is filmed, even at very low quality, you can almost always get an idea of the what, when and where. Sometimes also the why and how can be inferred by the video (think about a car crash or a fight in a bar) even if the quality is not that good. Also, missing information could be good information… at least we can exclude a location identified as suspect, if there is no relevant footage from the camera in that location. And often, even if the quality is not good for identification, we can still get a lot of information from the video: that he was a man and not a woman, that it was a black van and not a white car and so on. We should be more positive and see the glass half full and not half empty… actually I think it’s full for more than three-fourths… probably.